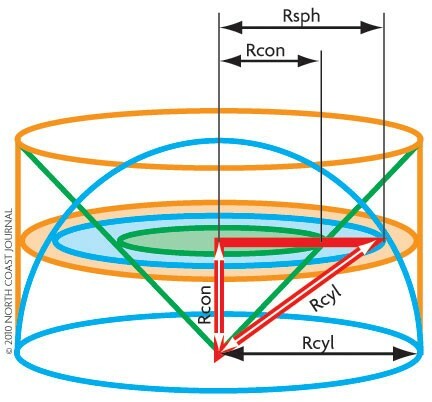 Volumes of the cylinder (orange), hemisphere (blue) and cone (green) are in 3 to 2 to 1 ratio. And so I took a good look round all the numerous tombs that stand beside the Agrigentine Gate. Finally I noted a little column just visible above the scrub: It was surmounted by a sphere and a cylinder. The sphere and the cylinder were the tip-off for Roman writer Cicero, quoted above, as he was searching for Archimedes' tomb 137 years after the Greek mathematician's death. The objects were carved on the tomb to celebrate Archimedes' proudest achievement, that of calculating the volume of a sphere. It's relatively easy if you know how to integrate, but Archimedes lived 2,000 years before Isaac Newton and Gottfried Leibniz co-invented calculus. How did he do it? He used calculus! Archimedes of Syracuse (287 B.C.E. to 212 B.C.E.) wasn't just the greatest mathematician of the ancient world but also a physicist, engineer, inventor and astronomer. He died by accident, sort of. After the Romans finally prevailed in their two-years-old siege of Syracuse, Sicily, a Roman infantryman found Archimedes working on a problem in the sand outside his house. "Don't disturb my figure!" he growled, prompting the impatient soldier -- despite orders to spare the old man -- to slay him. area of the cylinder's circle = area of the hemisphere's circle + area of the cone's circle. volume of the cylinder's slice = volume of the hemisphere's slice + volume of the cone's slice. From which, as I bet Archimedes was thrilled to discover, the ratio of the volumes of cylinder : hemisphere : cone are 3 : 2 : 1. Tomb-topping magic! Barry Evans (barryevans9@yahoo.com) would give a lot to sit down with Archimedes over a beer. His (Evans', not Archimedes') publications are at Eureka Books.